In a brick & mortar business model, knowing your customers is extremely important. This helps you plan everything detailed and also, enables you to decide the pros and cons. Today, almost every brand moving is to the internet. But, knowing customers without a tool on the web is way too difficult. But, AdWords users don’t have to bother about this. The Audience Insights offered by Google allows marketers to get customer details with an ease. 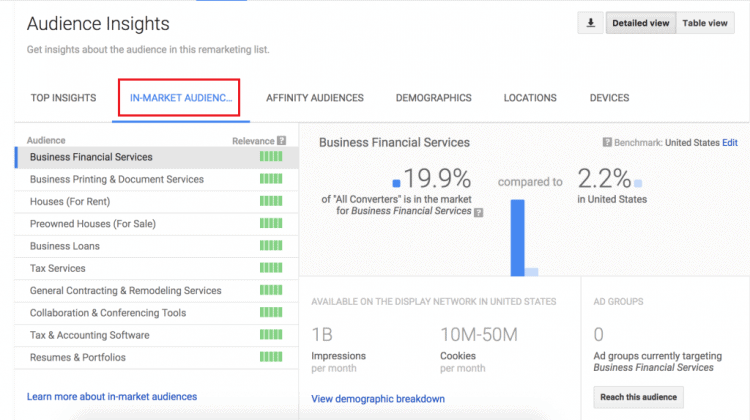 What are AdWords Audience Insights? Audience Insights is a reporting system that allows advertisers to know their customer base as well as finding new and desired audience to target. The report can be obtained on several places like Customer Match, App, and YouTube remarketing lists. The data collected in the report comes from each particular audience’s interests, demographics, locations and device usage which enable marketers to adjust their strategy on own. How is AdWords Audience Useful to Users? The Audience Insights help you get actionable feedback so that you can make a well-planned adjustment to your strategy. You can check the progress of your current campaigns and ad groups. Audience Insights allows you to get to know each and every detail of your customers like intent, affinity, demographic, location and devices used. Once the advertisers come to know their customers, they can now stretch their ad group targeting and make the bid adjustment especially to drive new customers to their business’s funnel top. How to Apply Google AdWords Audience Insights? The criterion for being “In-Market”, the user has to actively search and compare products and services online. Google goes for adopting a wide range of device activities while determining a user’s affinities. Google collects all information related to the interests of the users through Android, iOS and user’s browser activity. The data don’t ensure the entirety of your customer base as they would be using alternative operating systems or may have never used DoubleClick’s servers. You can know the age, gender, and parental status of consumers as Google has made several systems where users put their personal data. Google also avails data from user’s web browsing and app activity done on mobile devices while household income data is gathered through I.R.S. 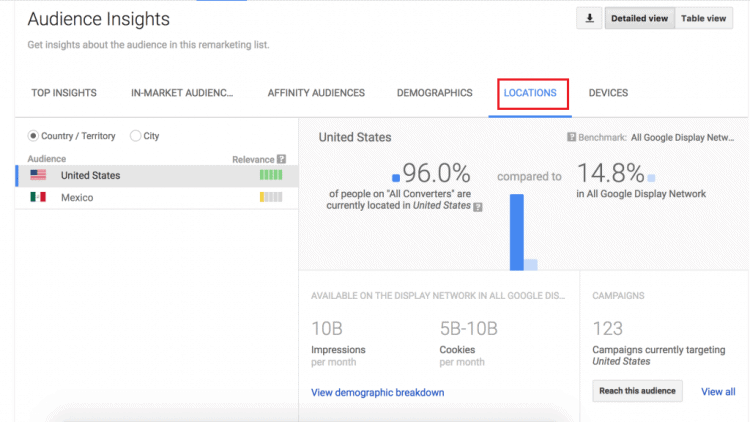 AdWords determines a user’s location in several ways, possibly by the IP address of the computer, the Wi-Fi network, GPS, Bluetooth and the mobile tower. 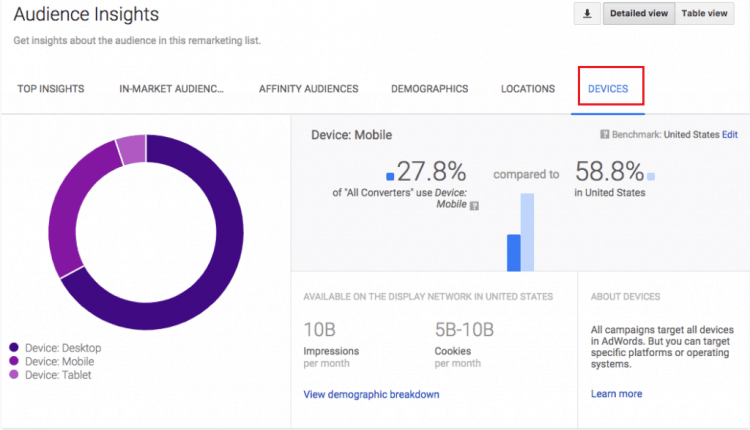 AdWords finds the devices by the device used for browsing and these devices can be Desktop, Mobile or Tablet. If you see your remarketing list, you’ll find most of the activities have done through mobile rather than others. Therefore, it’s necessary to have a site that offers a useful mobile-friendly user experience. How to access AdWords Audience Insights? Click Shared Library available in AdWords’ side navigation. Then click on “View” available below the Audiences. 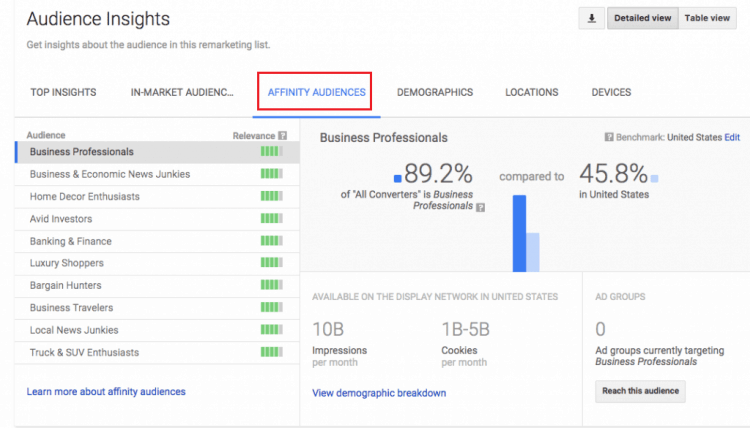 Now, in Audiences, choose the remarketing list you want to. Now, you’ll see top insights about the remarketing list you’ve chosen. 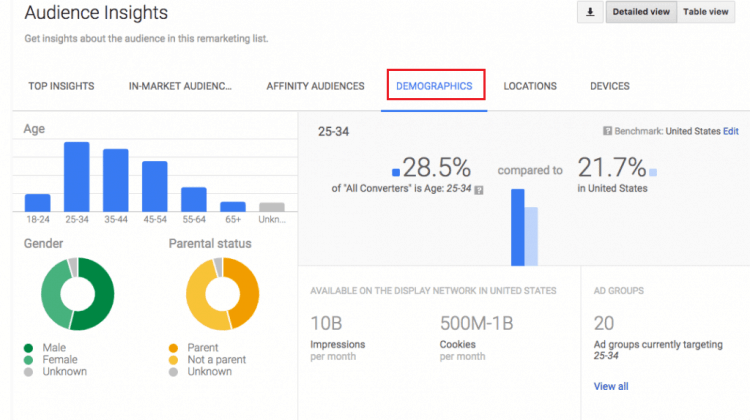 To get detailed insights, click on In-Market Audiences, Demographics, Affinity Audiences, Locations, and Devices. Now, when you’ve accessed Audience Insights, it’s time to take your campaign targeting to the next level. When you’ve gone through the aspects of Audience Insights, you can identify your audiences as who they are, what interest they shoot, what their intentions could be. Thus you can go for ad customization and this would result in higher conversion rates. Audience Insights is a tool that allows marketers to see and utilize the opportunities which could have been difficult to access with manual interpretation. Google AdWords is a Google product that has specifically been made to give analytical data of ad campaigns to the marketers. AdWords provides Audience Insights, a tool for accessing all the information about the users including age, gender, demographics, location, and others. This article will guide you towards knowing Audience Insights in detail, so that you can use it in potential ways.